This too shall pass sis. Just stay strong and keep on praying. For sure God will lead you to the right path. Everyone have and will undergo this phase in life and after this I am so sure you will be much stronger. I do feel the same once in a while. But I keep on praying and thinking that I work not for me but for my family. Ate Krizza, sabi nga sa poster, "PUSH." While painstakingly praying, listen to your heart too. What is it that you want or miss or is lacking in your life? What can you do to bring back the luster in your life? Whatever it is you are feeling right now, I pray for strength and peace of mind for you Sis. Just be strong and do what your heart tells you to do. As the person concerned, I believe you are the best judge and the best person to decide what to do with your current situation. Do what makes you happy and pray for God's guidance and protection. I'm your your family especially your kids will always be there to support you in all whatever decision you will make. Stay strong and remember to always look at the brighter side of the situation. HUGGGSSSS! Hope that you be able to feel better soon. Hugs to you too. I hope you're feeling better now. We all have our highs and lows. Just continue praying, Sis. It will really help. I also felt this before and it's quite normal, especially when we question our existence and purpose in life. It's right to approach these situations with prayer. I believe God will enlighten you through the Bible. 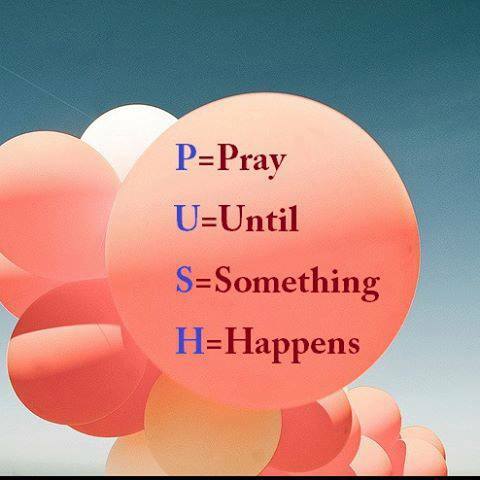 PUSH has been my mantra lately.. I hope it will still keep me once the school year starts. I know it will! When I reached 40, I felt the same thing too. It's one feeling that I got puzzled with my self too. OBGyne said...hormonal changes...reaching another stage of maturity. When I learned this (after a couple of years) I understand and feeling passed. Accepting Jesus really helped me the best. When feeling comes..I ignore it and focus on what could make me happy. Sometimes I tell my husband about the feeling so we go out and have fun. My children are aware of it too and sometimes they jokingly wait for it for us to go out and have fun! It will pass. Sis. With God's help it will. Positive lang! When you think negatively panget un kaya kailngan good vibes! Whatever it is, don't worry about it. It will pass. Time flows, so don't fret about it. I also get these feelings, sometimes and I tend to blame it on hormonal changes also, you know, the normal cycle of women. I didn't like the negative feelings and what's so frustrating at times is you can't quite put a finger on what's really wrong. I find that doing activities outside of the normal routine helps. Start a hobby or something. Just break away from the boring routine. But the best thing really is to get to the root of things. There is always an underlying reason and if you can find that, the better you can act on it and avoid feeling glum. Thing like that happens to everybody. The fact that you still acknowledge God and pray means you're still in the right track. This too, shall pass. Well, not everything that we pray is answered instantly. God has planned it very well that sometimes it comes when we least expect it. Don't expect much and let Christ carry your burden.